Our unique ten step method, supported by lots of witty little techniques is designed specifically to help you make a better profit per hour (more on what that is, below) and a Healthy Income. Stuff to read that’s bite-sized and easy to digest. We do the Healthy Income Program together-ish. 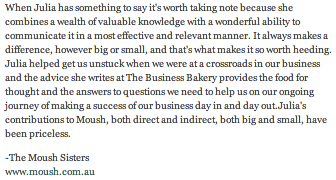 We ‘cook’ a selection of Business Recipes and notes together twice a week. It’s just enough work to make a difference and not too much to be overwhelming. To make it super-easy, most of the Business Recipes have worksheets with them. You just fill them in and keep them handy that way you’ve got all the info you need at your fingertips. You get step-by-step instructions for everything. No more wondering what to do next. Once a month we get together to ask questions and have a chat. No more feeling alone. I thought you might be wondering how the Kitchen actually works. It’s pretty simple. When you sign up you’ll join our next series of Cookalongs. That way we’ll all be working on the same recipes together. Twice a week you’ll get a Cookalong-email from me talking about what we’re ‘cooking’ and why. it will also contain links to a selection of recipes to do and notes to read. Each Cookalong should take you about half an hour to do. I’m hoping it’s enough to make you feel like you’re making good progress but not so much that you feel overwhelmed. I know you’re busy running a business! Everything in the Kitchen is stored in the private Kitchen website. Recipes are in the Cookbook, Notes are in the Pantry and Worksheets are in the Utensils. The links in the Cookalong email send you straight to the right place so it will all be easy to find. The Recipes, Notes and Worksheets are all printable so if you don’t like reading on a screen you don’t have to. Here’s some practical stuff. You’ll have access to all the recipes and notes in the Kitchen that you’ve already covered in the Cookalongs, but you won’t have access to the future ones. Can I just ask you to believe me that it works best to get the information in bite-sized bits over a period of time? Truly it does. Once a month, via the magic of technology, we’ll get together around a virtual Kitchen Table. That’s when we’ll ask and answer questions and check in with progress. If a month is too long to wait you can always email us a question. Soon we’ll be starting real life Kitchen Tables. More on that to follow. I guess you’re wondering how long you need to be a member of the Kitchen? Well we’d love to have you here for as long as you’re finding it useful. The Healthy Income Program itself takes about a year to get through. But you can stop your Kitchen membership whenever you want. Even if you only stay a month you’ll have already done stuff which sets you up to make a Healthier Income. After a year there’s more cool stuff to do. But that’s quite a long way off, so I’ll tell you about that later. Is the Kitchen right for you? We designed the Kitchen to help intentionally-small business owners make a Healthy Income. An intentionally- small business is one that’s happy being small. So this probably isn’t for you if you see yourself as an early stage big business but it is for you if you’ve got a small business which you want to make more profitable. We’ve really put the Kitchen together with handmade and boutique businesses in mind. Cake makers, jewellery makers, dressmakers, virtual assistants, online retailers, shop owners, advisors, coaches, consultants, hairdressers, therapists, oh the list goes on. I think you get it. If you’re not sure whether it will suit you ask us here. Most of the people who join the Kitchen have been in business more than a year. That’s not because we don’t welcome new businesses. We do, we do! It’s just that when you first set out in business making a Healthy Income seems very doable and it’s not until you’ve been at it a few months that you realise it’s actually quite tricky. So if you are new to business you’re very welcome to join us, just ignore the stuff in the Cookalongs that asks you what you did last year! We know it’s a bit weird buying something without seeing it so if you join the Kitchen and it’s just not what you were looking for, we’ll give you your money back. Simple as that. Would you like to know a little bit more about what we cover? Here’s a little snippet on each of the ten big steps. We start by looking at what you want out of the business. What you’d like to earn, how many hours you want to work and what you love about your business. We do that so you design your business to suit you, because we are all different. Every business works to a recipe (true! ), but some recipes work better than others. 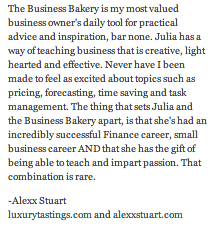 We’ll show you how to uncover your Business Recipe, look at how well it’s working and think about how to change it. Great businesses have a fabulous Raising Agent. And yours will too. We’ve just got to find it. Our very doable six-step technique will get to the heart of what makes your business special and will help you create your very own fresh and powerful Raising Agent. The first of four key ingredients of your business is pricing. Oh pricing! It’s super-important but hard to know what to do. Right? Well you can relax because we’ve got a very simple step-by-step method to walk you through it. We’ll help you work out your most profitable price plus we’ll show you some, shhh, secret pricing tricks. Don’t worry what CUP stands for, all will be revealed when we get to the second ingredient: the cost of making your product (or service). We’re pretty sure you’re doing it as effectively as you can right now - after all who’s got money to burn? But there are some clever little things you might not have thought about and we’ve got a method to help you uncover them. The third ingredient, COFFEE, is the cost of marketing and sales. What we’re going to do here is help you work out the most effective ways for you to find customers. And we’ve got some clever techniques that don’t cost the earth. The final ingredient COCOA is all the time and money you spend on stuff that’s not product and not marketing. Let’s just say this stuff adds up! But helps at hand as we’ve got a fabulous collection of tips to help you keep it manageable. One thing’s for sure, there are never enough hours in the day, but in this section we’ll show you how to make the best of the ones you’ve got. When you’re putting in a lot of effort, you need to know if it’s working. So that’s what we do here. We’ve got a collection of fabulously simple techniques to help you measure the stuff you need to know. Finally, you might want to add some new stuff into your business or even just change things around a bit. We’ve got a little system to help you decide what to do and how to do it. It’s all very simple. Kitchen membership costs just $45/ £23 a month. So that’s about $1.50 a day (less than 90p!). Even better, The Kitchen pays for itself. The extra profit you earn from the Healthy Income Program will more than cover the small cost of it. And if it doesn’t? Well we’ll give you your money back. Simple as that. Oh yes, and remember if at any time you decide you’d like to leave the Kitchen. You can. Just like that. Fancy you and four friends joining the Kitchen together? If you join as a group of five you’ll all get a 20% discount (for as long as you all stay in the Kitchen) AND we’ll give you some fab stuff on how to hold your own mini Kitchen-Table. Let’s just say mini Kitchen-Tables are inspiring, fun and simply the best way to keep motivated. If you want to join as a group of five send us a note on the contact form here and we’ll arrange it. Over at The Business Bakery we write blogs (the Daily Juice) and we share articles we think you’ll find interesting (the Scrapbook). This is all good information in itself but they are one-off ideas, not a program that takes you from start to finish. If you like the Business Bakery is a collection of interesting recipes whereas the Kitchen is the complete ‘How to Cook’. 2. How often do the Cookalongs start? 3. How do I join the Kitchen? You can pay to join the Kitchen via credit card (Visa, Mastercard) or Paypal. It’s a simple monthly payment and you can do it here. 4. How do I leave the Kitchen? When you join you’ll be given a place to manage your account. Cancelling your membership is easy and immediate.